Swimsuit season is coming, and many of us are likely diving into new diets and exercise plans to ensure they feel confident when they finally shed their winter clothes. However, sticking to a new nutrition plan is hard. Not that we’re biased, but at BlackJack Pizza in Loveland, we have a solution: cheat days! Hear us out — there are real benefits to cheat days, which we’ve listed below. Read on to learn more, and order BlackJack pizza delivery for your next indulgence! It’s practically impossible to eat healthy all the time every single day. Especially if you’ve recently cut yourself off from your favorite foods (like pizza), you’re going to be haunted by cravings for things you “can’t have.” The solution? Give yourself a break every once in a while! Make cheat days a part of your plan, and you won’t have to beat yourself up if – or, let’s be honest, when – you unintentionally fall off the bandwagon and give into those cravings. It will be easier to stick to your new nutritional plan if you’re honest with yourself and realistic about your cravings! Strict crash diets will only lead to short-term results, if that, while enjoying your favorite “unhealthy” foods occasionally will help you to continue working toward your long-term goals. Banning delicious dishes like calzones or hot wings from your diet is not going to make you happy. That ideal beach body may seem worth it, but do you really want to feel miserable until you can dive back into sweats and winter coats? At BlackJack Pizza, we think every body is a beach body, and we encourage you to only make changes to your diet that will make you happy. Fortunately, you can balance both your health and fitness goals and your food cravings if you plan for cheat days. When the endless dinners of grilled chicken and vegetables start to drive you crazy, indulge on those buffalo wings you’ve been dreaming of, and you can stay committed to your plan with a better attitude! If the idea of cheat days makes you worry about going overboard or losing sight of your goals, remember that you are making cheat days a part of your plan and your routine. You can set limitations on how much you can cheat on your cheat days. You can also pair it with a day when you have a particularly tough workout, and use it as motivation to push through it and a reward for finishing strong. A little extra exercise may help offset the spike in calories and whatever guilt you may feel. When it comes to making healthy choices for yourself, remember to keep everything in moderation — including moderation! Limiting calories shouldn’t mean limiting fun and enjoyment. 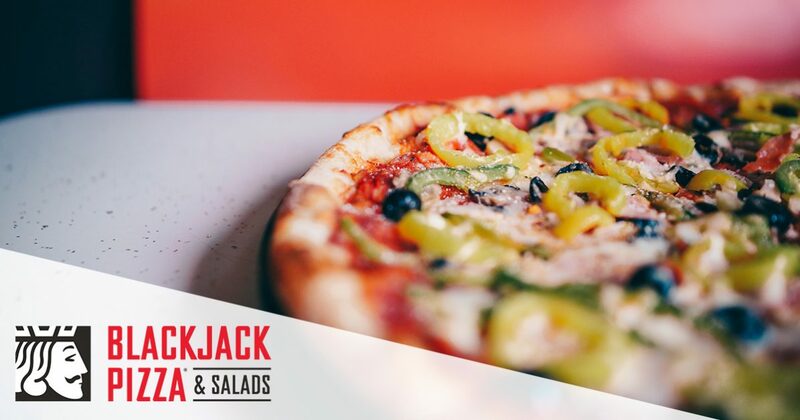 And don’t forget, BlackJack has several healthier options you can choose from! Pair your pizza with a salad to add some greenery into your diet or create your own pie and load up on all the veggie toppings we offer. Make today your cheat day – or your I-deserve-a-pizza-for-all-my-hard-work day – and start your online order today!